"Traditional Recreational Values" include but are not limited to: Hunting, Fishing, Off Road Vehicle use, Hiking, Camping, Bird watching, Photography and Enjoyment of the Big Cypress. 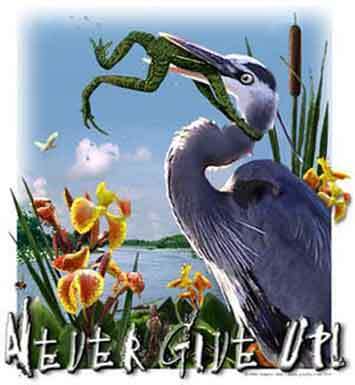 The Heron is protected, "It's Time to protect the Endangered Sportsmen!" The 729,000 acre Big Cypress National Preserve was set aside in 1974 to ensure the preservation, conservation, and protection of the natural scenic, floral and faunal, and traditional recreational values of the Big Cypress Watershed. The importance of this watershed to the Everglades National Park was a major consideration for its establishment. The name Big Cypress refers to the large size of this area. Vast expanses of cypress strands span this unique landscape. For the real link - http://www.nps.gov/bicy/index.htm The American Indians sued the Department. of Interior and a Federal Judge shut down all the Department. of Interior Computers for not protecting the American Indians Private Information. The BCNP web site is back up now. This Site Brought to You through "Freedom of Speech"
Link to Steve's "Big Cypress Swamp"